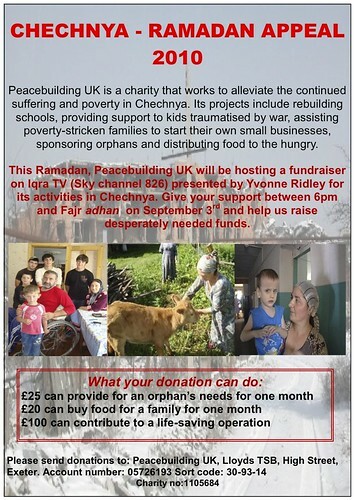 This Friday we will be making a fundraising appeal for PBUK and for the Dobrota charity as part of a broader appeal for many charities during Ramadan. If you have Sky, turn on Iqra TV (Sky channel 826) in the early evening to see the appeal and Chris Hunter, PBUK’s programmes co-ordinator, being interviewed, as well as interviews with PBUK Trustee Alaudin Chilaev, and Dobrota fundraisers Sofia Janjua and Adil Wainwright. Iqra TV are helping us and Dobrota to raise money to rebuild schools in Chechnya, provide psychological support to children and teenagers traumatised by war, assist poverty-stricken families to start their own small businesses, sponsor orphans and distribute food to the hungry. £25 can provide for an orphan’s needs for one month, £20 buys food for a family for one month and £100 can help make a life-saving operation happen. Please head to our donations page to find out how to donate. This entry was posted in Appeals, Dobrota, PBUK and tagged Caucasus, Chechnya, Dobrota, Financial appeal, fundraising, Iqra TV, PBUK, Peacebuilding UK, PeacebuildingUK by Rachel. Bookmark the permalink.